There’s one week until Christmas Eve! I don’t know about you, but I’ve got to slow down on the shortbread, mincemeat tarts, and eggnog, and start saving room for Christmas dinner! Today’s guilt-free recipe is fresh, seasonal and festive. It features an array of winter citrus and crimson pomegranate, presented prettily in a fresh take on a fruit salad. Beverage: Coffee, Juice, Mimosas, Hot Cocoa…something special for both you and the kids. Fresh Fruit: That’s where this salad comes in! Warm Baking: Croissants, Scones with jam, Cinnamon Buns or these best ever muffins. Now, please note that I am talking about breakfast, not brunch. Brunch is entirely different, and we’ll talk more about it next week. I really mean breakfast, as in a little something at 7 am (or earlier depending on what time the kids jump on you) to start your morning off right. It should be simple, but still special. It IS Christmas morning, after all. For whatever reason, the term “Fruit Salad” conjures up unpleasant memories for me. Hacked up, tasteless fruit – or worse yet, a can of fruit cocktail opened and poured into a bowl. When you live in the North, as I do, it’s hard to nail a good fruit salad at Christmas time. The produce is generally dry, tasteless and has traveled far too many miles to your table. 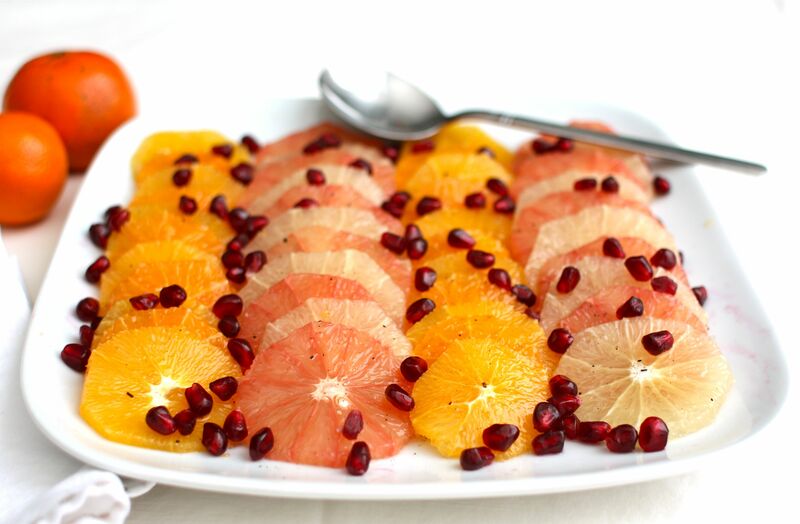 This citrus salad embraces what is in season at Christmas: oranges, grapefruit, pomegranate and clementines. Sure, it has traveled to your table, but it’s bursting with flavor, unlike those pale strawberries that should be at the supermarket. Two extra ingredients give this fruit salad an element of surprise and extra level of flavor: rose water and vanilla sugar. Rose water, a condiment commonly found in Middle Eastern cuisine, can easily be found in major grocery stores and ethnic markets. A mere splash of the rose water’s delicate perfume and this simple breakfast side dish is transformed. Wash and dry fruit. Assemble a large cutting board, a sharp knife and a bowl to hold the citrus peel. Slice off either end of the citrus, and remove peel as demonstrated in the video clip below. Peel all citrus and thinly slice. Reserve the peels for marmalade if you like. Select a large serving platter for your salad; it should have slightly rounded edges to be able to hold the orange juice that will seep. Arrange fruit on platter any way you like. In the photos I have alternated slices of pink and yellow grapefruit in one column, and orange and tangerine in another. Another pretty way is to start in the center of the plate and layer slices of citrus in a circle building outward. In a small bowl, stir together rose water and vanilla sugar until sugar is dissolved. With a small spoon, drizzle mixture all over the layers of fruit. 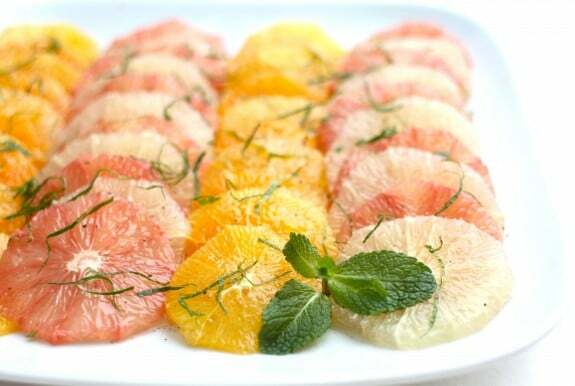 Prepare and arrange the citrus slices on a platter as directed in the recipe above. 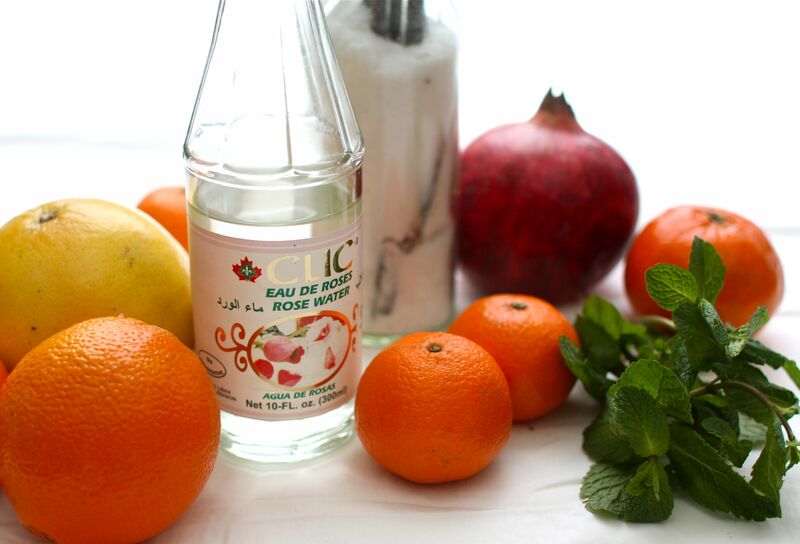 Combine orange blossom water and honey together to make a syrup and drizzle over fruit. Finely chop mint leaves -reserving a few for garnish- and strew on top of the salad. Serve at once. If you think I’m doing this much knife work on Christmas morning, then you are mistaken! 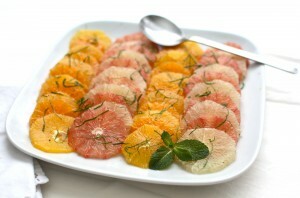 Another one of the attractions of this citrus salad is its ‘do-ahead’ adaptability. The evening before your breakfast or brunch, remove the peel from all of the citrus as shown in the video, but do not slice the fruit. Wrap each peeled orange or grapefruit in a small piece of plastic wrap,and stash in a Tupperware container. Cover and refrigerate overnight until ready to use. You can also make the vanilla syrup ahead of time. In the morning, simply unwrap the fruit, slice, and arrange on a plate. Proceed with the recipe as usual. This post is brought to you by Tattler Reusable Canning Lids. Finally, quality canning lids that last a lifetime for any type of home canning. Tattler reusable canning lids are also BPA-free. Psst! Stay tuned because I’ll be giving away some lids from Tattler tomorrow! How do you like to enjoy the winter fruits? Ooh can I tag along with the grapefruit with pomegranite loving! My absolute fav! This is almost exactly what I had planned for christmas morning this year! Except your refinement with the special beverages for the kids and this beautiful salad are super helpful. I was thinking I’d do a bunch of out-of-season fruit to make up a salad. But obviously, this would make much more sense. Thanks again Aimee! Cindy – my boys will have watered down apple juice, as per their usual morning. Hot cocoa will be for after we get out for a walk. I think my kids would be more likely to eat this if all of the inner membranes were removed and esp. the core. I think it’s called supremed citrus. (?) I’d kill to learn a way to do that quickly! What a great Christmas morning recipe!! Great job! It looks delicious. I think I’ve just found a new Christmas morning fruit salad….thanks! I love that this can be mostly made ahead of time. This looks beautiful and sounds delicious! I won’t be near any grocery stores that would carry things like rose water before Christmas (we’re in the boonies!) or I’d definitely make this for breakfast. What a lovely spin on fruit salad! I love all the variations! This is gorgeous…and sounds so yummy. really appreciate having a citrusy winter salad like this one on the holiday table when everything else seems to be sugar & fat laden (not that i’m complaining about that) but it is nice to have a taste of something refreshing! I love the colors of this salad. So bright and cheery for a cold, white winters day. The two are staples at my Christmas brunch! I’ve been trying to think of new and interesting ways to use my grapefruits, and I love pomegranates. I’m going to have to try this soon. I might try with orange flower water too – I find it goes really well with citrus. Perfect breakfast for Christmas morning, Aimee! And you are right, brunch is an entirely different event. This is the best for that early morning fare! What a gorgeous and gorgeously simple salad! I love the addition of pomegranates. I make this salad – without the rosewater. I can’t wait to try this, I absolutely love pomegranates!